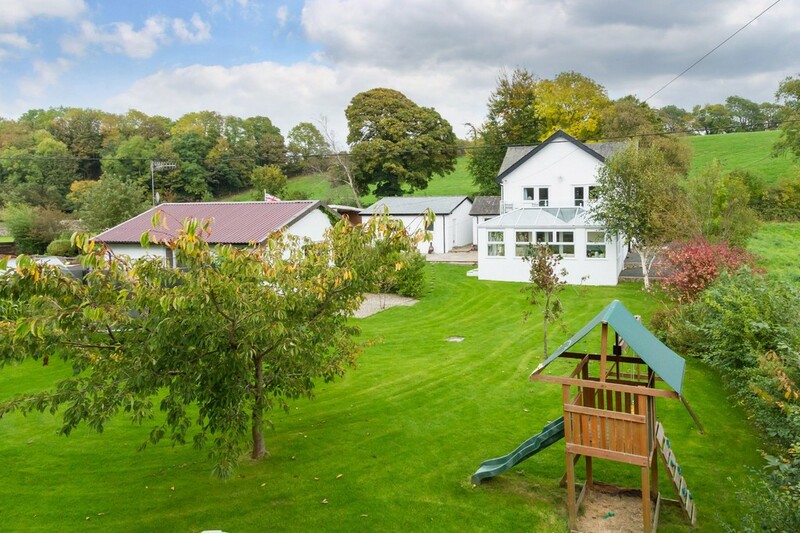 This is a superb, 5 bedroom family home with extensive outbuildings that provide tremendous scope and potential for further development, easily accommodating working from home with hyper-fast B4RN broadband or indeed if additional living space is required for dependent relatives. 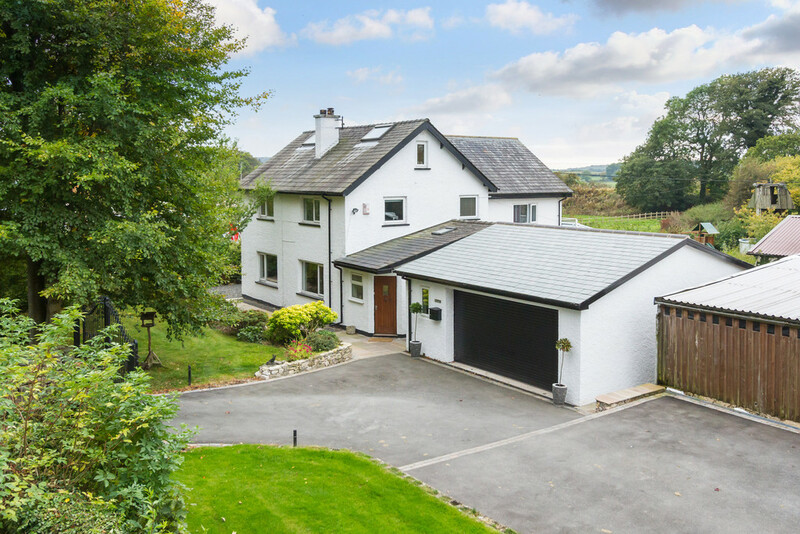 Set in approximately 1.25 acres of grounds on the periphery of the popular North Lancashire village of Burton in Kendal, Burtlands has been carefully and creatively extended and developed by the current vendors and now provides exceptional family living space over three floors. 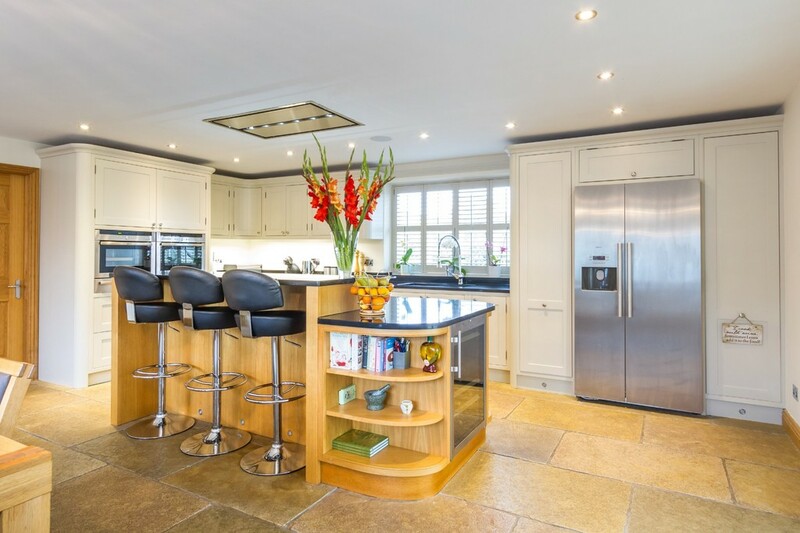 A magnificent dining kitchen, which flows through to the impressive Orangery, is further complemented by two super reception rooms and a handy utility. 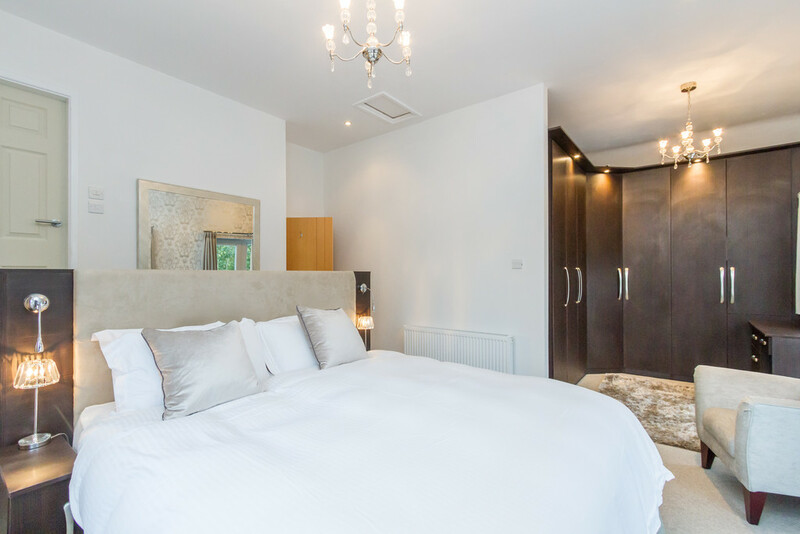 The first floor boasts four double bedrooms, one of which is the master suite, complete with balcony over looking the garden. There are also two great house bathrooms on this floor. 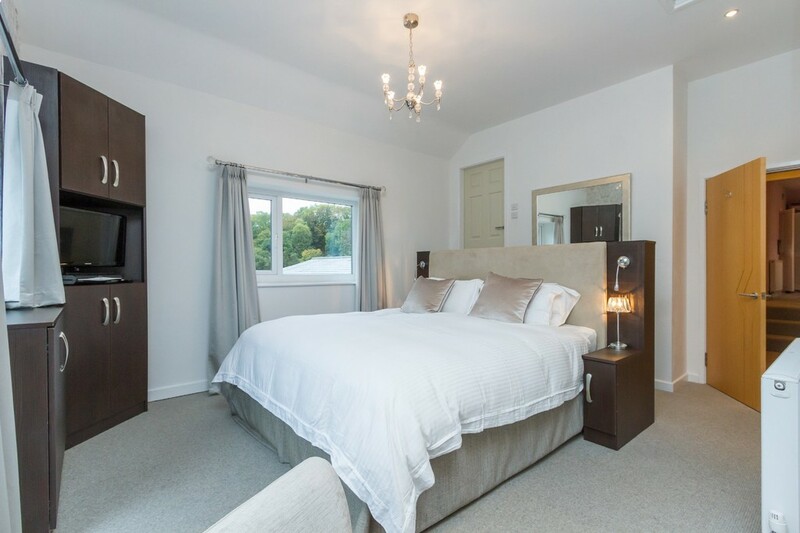 The fifth bedroom occupies the whole of the top floor and is a fantastic space for teenagers or children as a bedroom or games room. 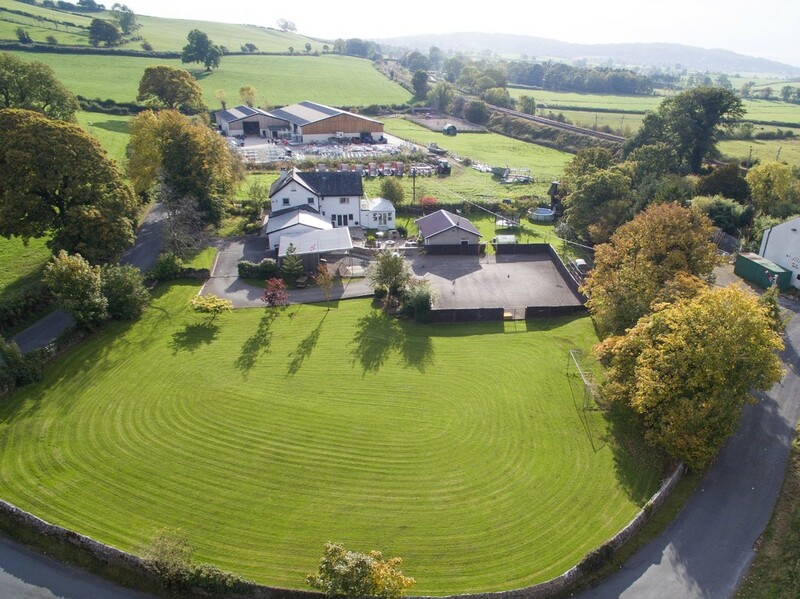 Outside the secure, electric gated driveway leads to ample parking for at least ten cars, a double garage with attached office and kitchen facility, timber barn and detached, highly versatile ‘games’ room with shower room; ideal for a wide variety of uses. Located close to the popular village of Burton in Kendal which has a thriving community and benefits from a good range of local amenities, including outstanding primary school, village pub, store and post office, the property is also ideally located for commuting and enjoys superb accessibility to the wider area with the popular market town of Kendal being only ten minutes away and the M6 J36 and J35 being just over 4 miles away. The west coast mainline at either Oxenholme or Carnforth/Lancaster provides excellent connectivity to Manchester and London. 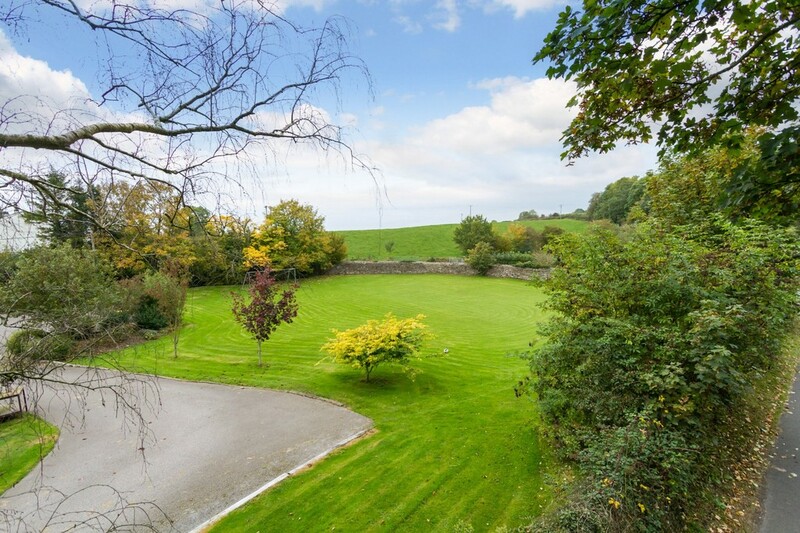 The property is also in the catchment area for Queen Elizabeth School in Kirkby Lonsdale. 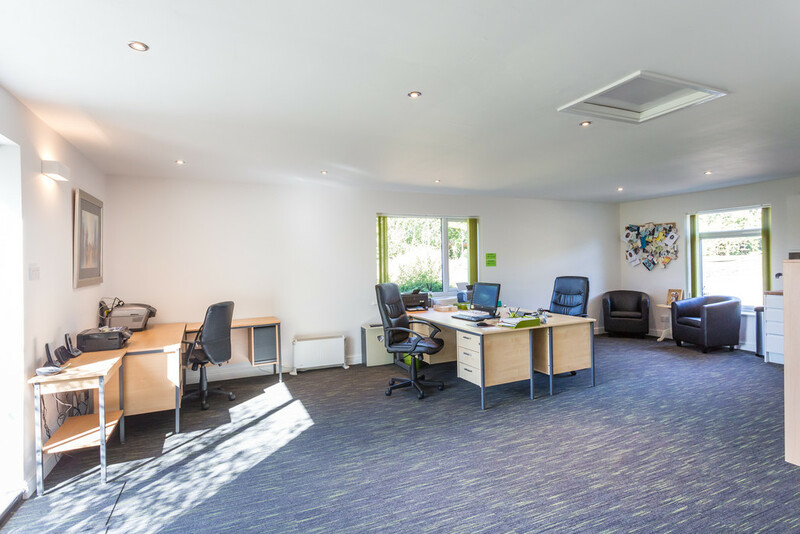 Nearby Milnthorpe is also a wonderful little village with a vibrant community and a good choice of amenities such as doctors, dentists, beauty salons, cafes, shops and restaurants and even includes a highly regarded local supermarket. 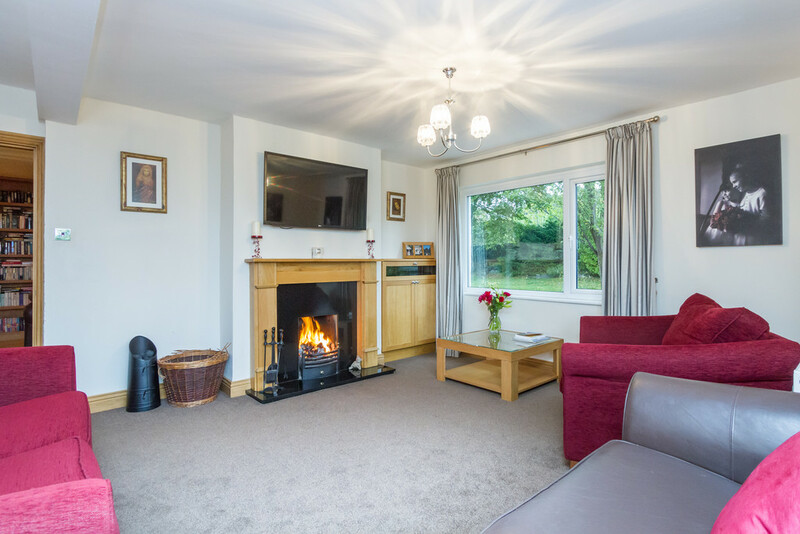 The property is ideally located for access to the Lake District National Park and all it has to offer whilst being practically positioned for everyday life. Silverdale, Arnside , and Kirkby Lonsdale are also only a stones throw away. 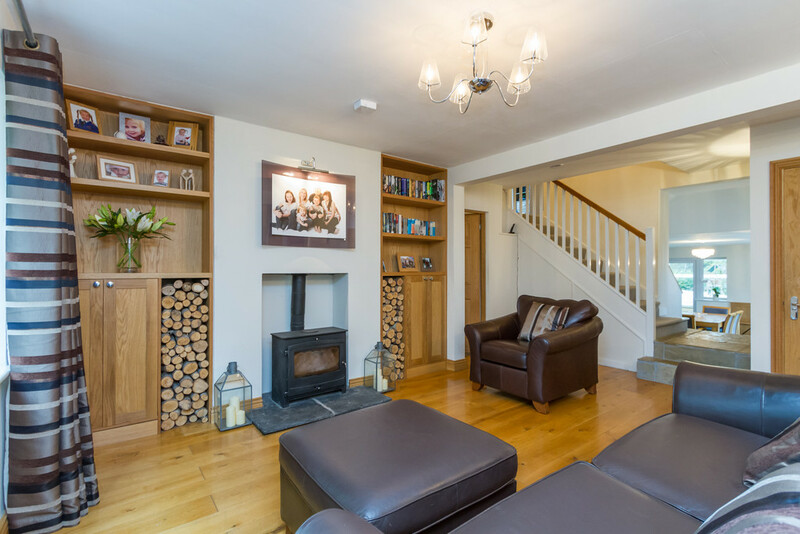 Entrance Hall A spacious and welcoming entrance hall with fitted oak shelving. 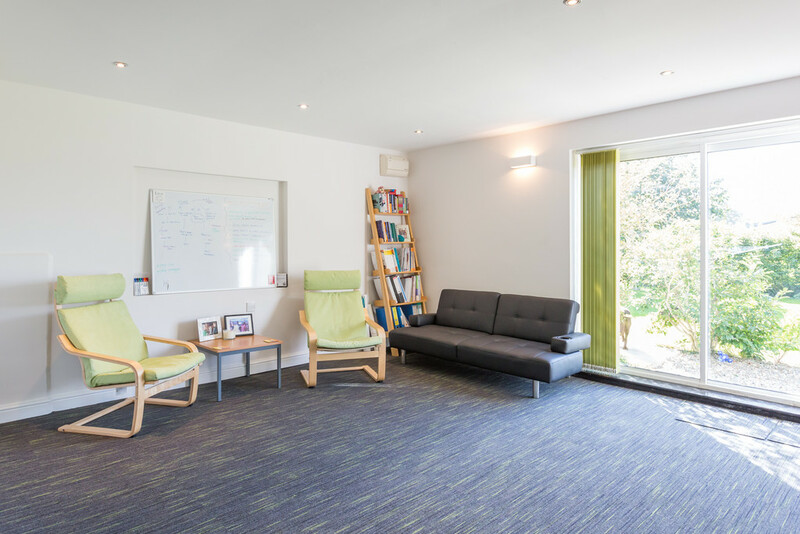 Utility Immediately adjacent to the entrance hall this practical facility has a good selection of wall and base units, a stainless steel sink and drainer and ample space for a washing machine, tumble dryer and large, additional, tall fridge freezer if required. WC A useful facility with WC and wash hand basin with tiled detailing and oak floor. 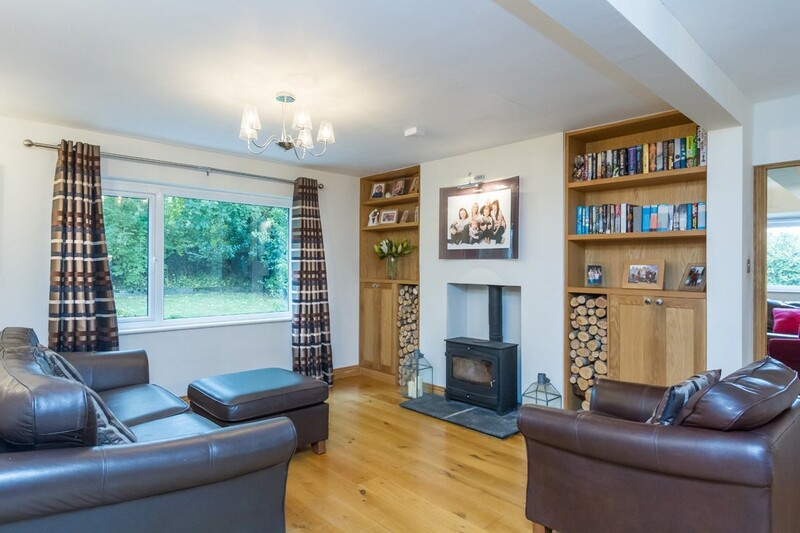 Sitting Room 20’4 x 14’5 (6.21 x 4.40) This delightful second reception room is extremely homely and benefits from a superb selection of bespoke, oak alcove units including cupboards and shelves, library shelving and an attractive wood burning stove set upon a slate hearth. 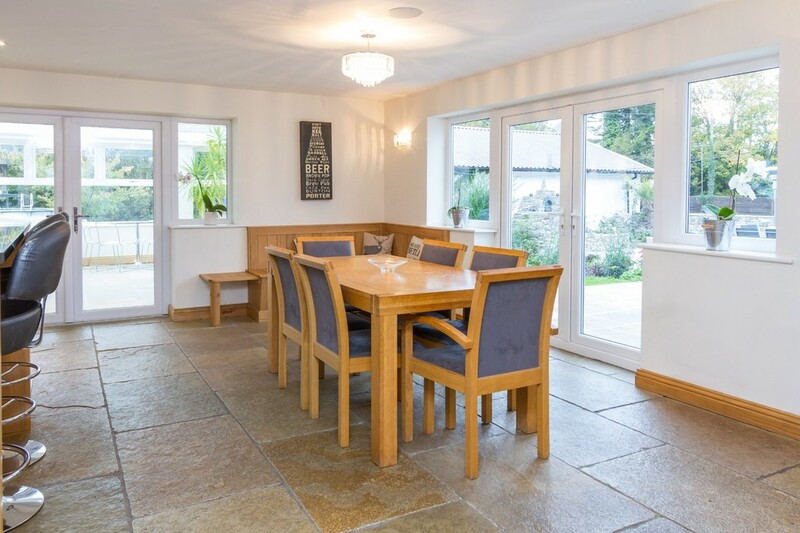 Oak flooring completes the room along with the bespoke Oak skirting boards that run throughout the ground floor. Living Room 15’3 x 14’9 (4.65 x 4.50) The principle reception room that benefits from good proportions. 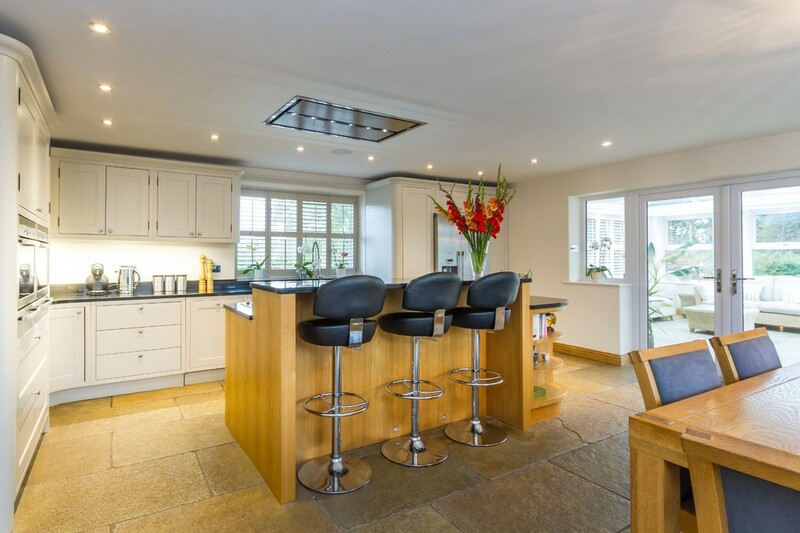 The open fire set upon a black granite hearth with black granite and oak surround provides a beautiful focal point. 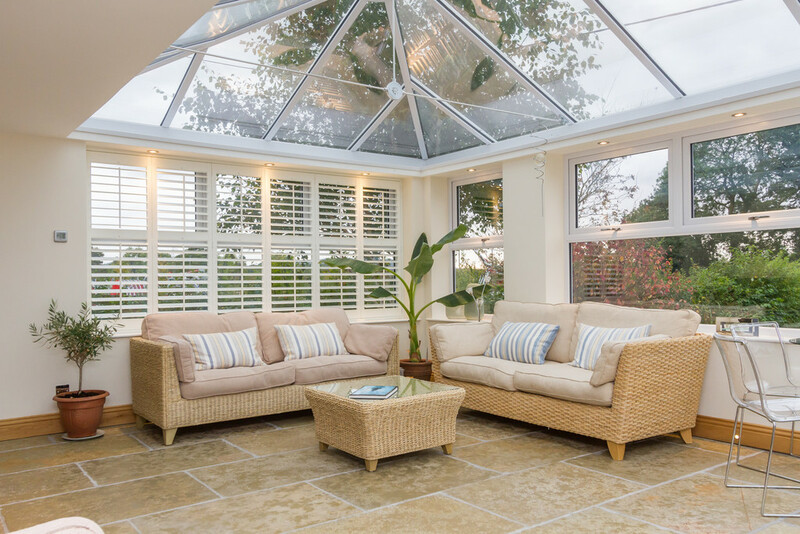 Orangery 21’1 x 16’2 (6.42 x 4.93) A spacious, bright space with solid Olive stone flooring complete with under floor heating, views over the garden and access to the patio area. Boot Room Immediately adjacent to the kitchen is a handy boot room complete with shoe and coat cupboards and with external access and airing cupboard housing a backup combi boiler system. Master Bedroom 21’0 x 16’4 (6.39 x 4.98) A superb suite that benefits from a dressing area, complete with a fantastic selection of built in storage solutions. The delightful dual aspect and balcony allow for picturesque leisurely mornings! The stylish and modern en suite shower room features a double shower cubicle with Grohe rain shower, pedestal wash hand basin, towel radiator and WC. 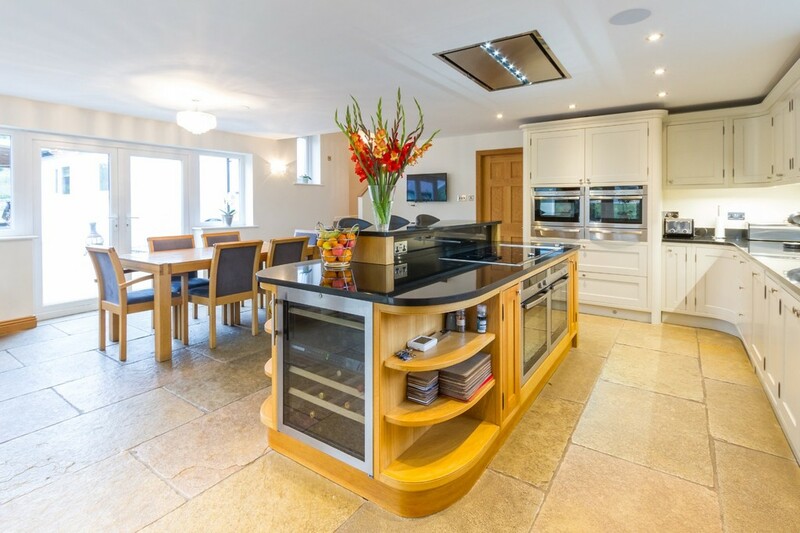 It has been tiled in a contemporary style to finish. Both the bedroom and the en suite enjoy underfloor heating. Bedroom 12’10 x 11’11 (3.92 x 3.64) A well proportioned double bedroom with a dual aspect looking out over the garden and with fitted wardrobes and dressing table. Bedroom 13’8 x 11’11 (4.17 x 3.63) This further, comfortable double bedroom also has a dual aspect and a solid range of fitted furniture including wardrobes, drawers and dressing table. House Bathroom Very well appointed, this stylish bathroom features a white Jacuzzi three piece suite, with bath with shower over, wash hand basin, towel radiator and WC. Bedroom 11’0 x 8’8 (3.36 x 2.65) A comfortable double bedroom with fitted furniture and the benefit of underfloor heating. 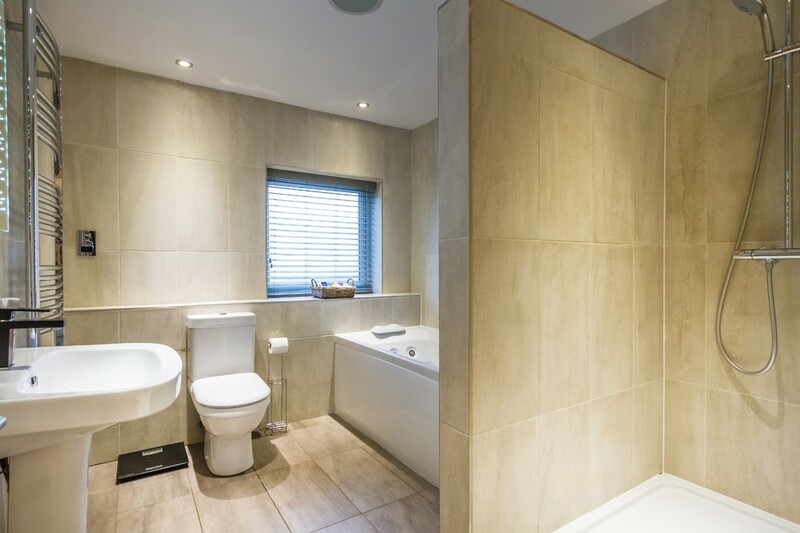 Family Bathroom Featuring a stunning Jacuzzi bath, walk in Grohe rain shower, pedestal wash hand basin, WC and towel radiator and underfloor heating, this lovely facility is modern and bright and ideal for guests or family as a principle bathroom. 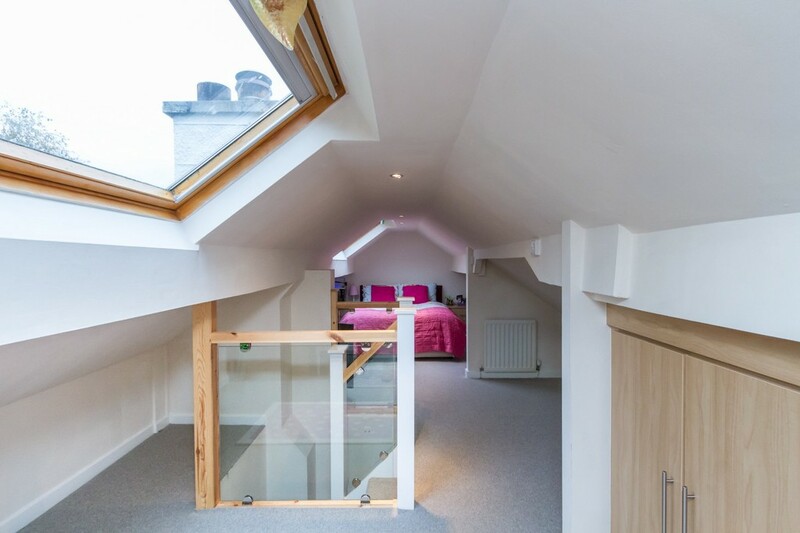 Second Floor 28’2 x 12’8 (8.58 x 3.86) Occupying the whole of the top floor, this converted loft space has been creatively adapted to provide a super bedroom ideal for teenagers. Modern glass balustrades, Velux windows and vaulted ceilings are complemented by a super selection of fitted wardrobes and dressing table. Outside The outside space at Burtlands is fantastic. 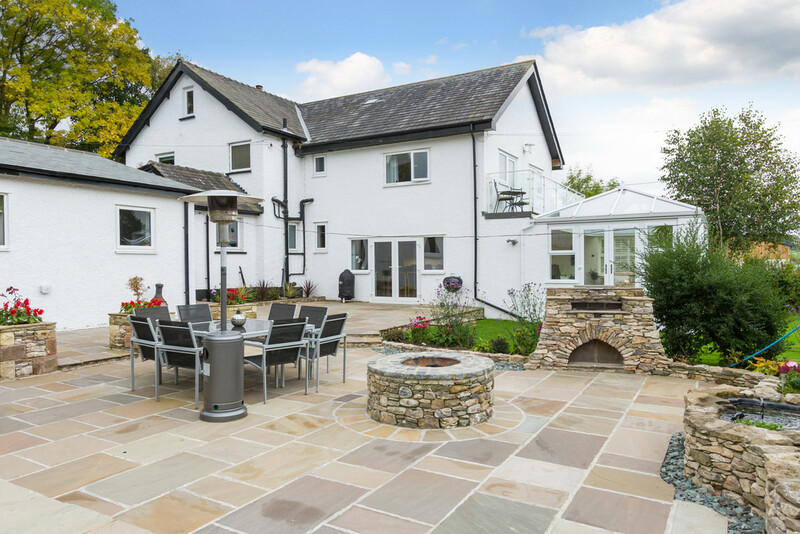 Set in approximately 1.25 acres, leading down to the stream at the bottom of the garden, this wonderful family home benefits from electrically operated wrought iron gates that lead to the vast parking area with ample parking for in excess of 10 cars. Previously utilised as a tennis court, this hard surfaced area could easily be restored to provide the ideal space for a range of ball court games. Hedges, trees and stone walls provide a secure boundary ideal for children or pets. 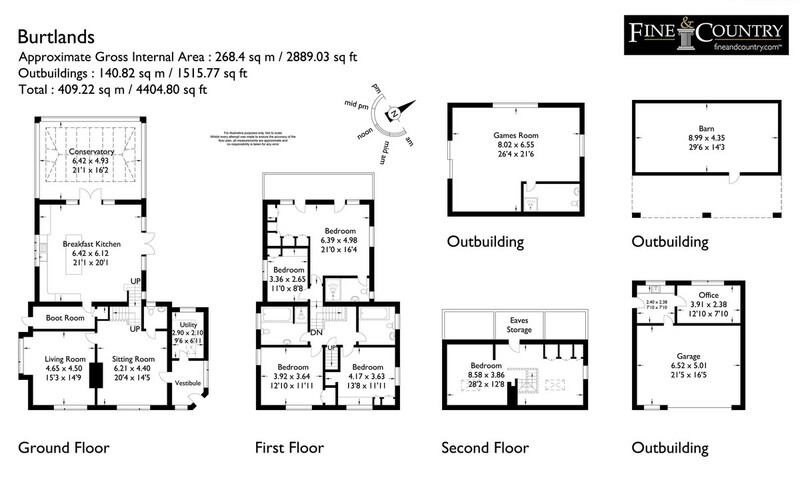 Practically there is a double garage with electric roller door and attached office space with separate kitchenette. A timber built barn is ideal for storage and the lean to provides a useful covered area. 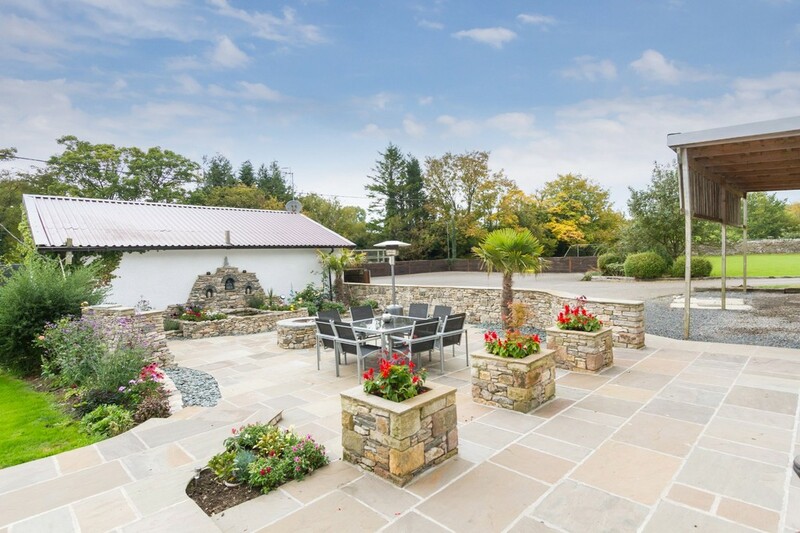 There are plenty of lawn areas coupled with a beautifully landscaped patio area which has been planned perfectly for al fresco dining and entertaining, with a stone built BBQ, pond and fire pit. 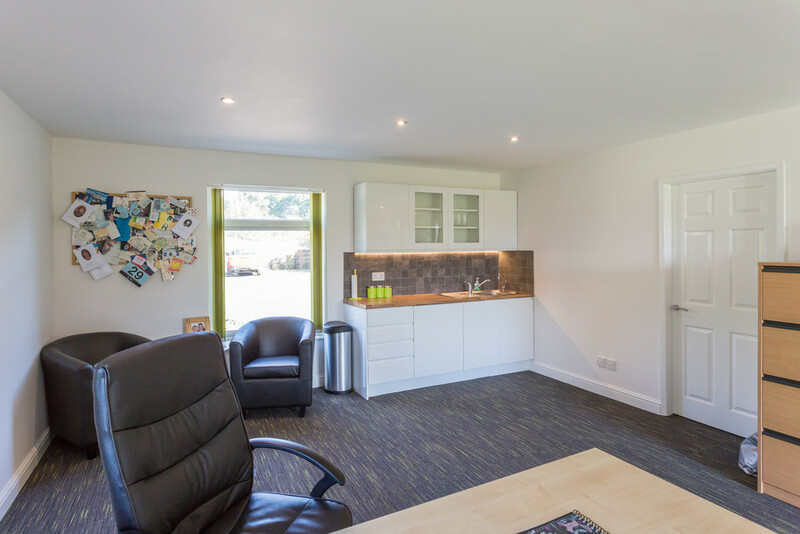 The detached studio with shower room is presently utilised as an office space but is very versatile and could be very easily adapted for a range of uses. The timber play park will be of interest to those with young children. Directions Leave the M6 at junction 35, following signposts for Carnforth/Morecambe. At the roundabout take the 2nd exit, onto the A6 heading towards Milnthorpe travelling for approximately 0.9miles. At the next roundabout take the 2nd exit signposted Burton in Kendal. Continue for approximately 2miles. On entering the village you will pass the Kings Arm, take the first left after that onto Neddy Hill, continuing onto Station Lane. Follow the road around to stay on Station Lane for approximately 0.4 miles. After crossing the canal bridge and continuing around a bend, take the first right hand turn to stay on Station Lane and Burtlands is the first property on your left hand side.